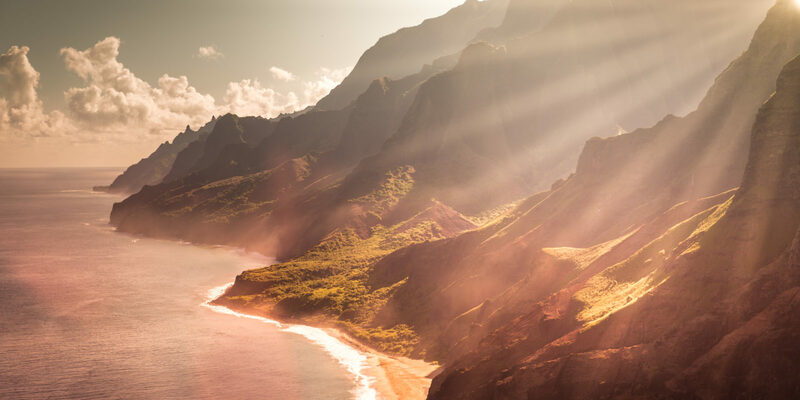 I must have been one of the few people in the world — or, at least, in the United States — who didn’t have Hawaii at the top of my list of dream vacations. Sure, I knew the beaches were gorgeous, the weather was balmy and the cocktails were fruit-and-umbrella perfection. But the 50th state in the nation always seemed a bit too familiar and not quite exotic enough to justify the long flight from my home in New York City. I discovered just how foolish when I found a sweet flight deal: a $400 round-trip, direct flight from JFK to Honolulu in the middle of February. That’s cheaper than most flights to the Caribbean, so three friends and I booked a week in the Aloha State — four days in Oahu and three in Kauai. We enjoyed the kitschy charm of Waikiki and the North Shore’s shrimp trucks. But I didn’t really fall for Hawaii until our last, perfect day on Kauai. We kicked off the day with a whale-watching excursion guided by Captain Andy’s Sailing Adventures and Raft Expeditions. The half-day catamaran cruise started with snorkeling (we spied turtles and not much else). 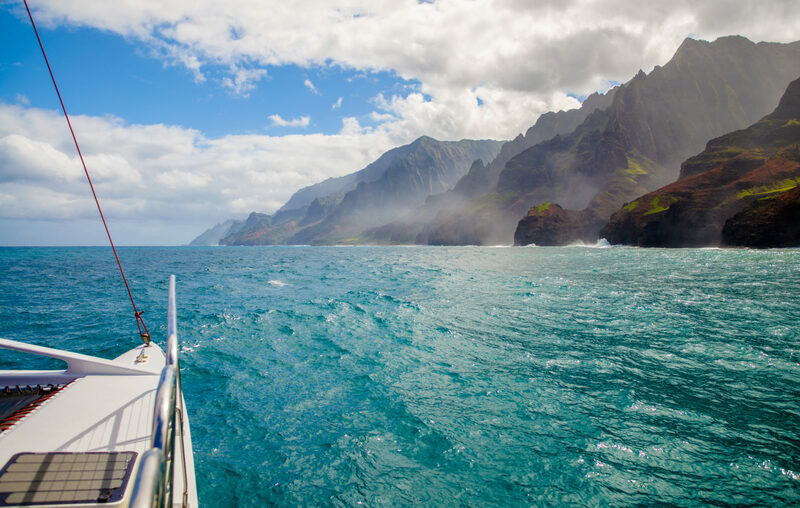 But we were really there to see the dramatic Na Pali Coast from the water — and to spy on the humpback whales that breed in Kauai’s warm waves each winter. We sipped cold beers while sailing by the jaw-dropping coast, and then squinted into the distance to look for humpbacks. We didn’t squint for long. A pair of gentle giants spouted, and then another two showed up a few feet away from our catamaran. Soon enough, so many whales were cruising nearby that even the crewmembers ran below deck to grab cameras! Wear a rash guard or apply sunscreen at least a half hour before the catamaran trip begins. The chemicals in the lotion are bad for the reefs, and Captain Andy won’t let you lather up right before you jump into the water to snorkel. 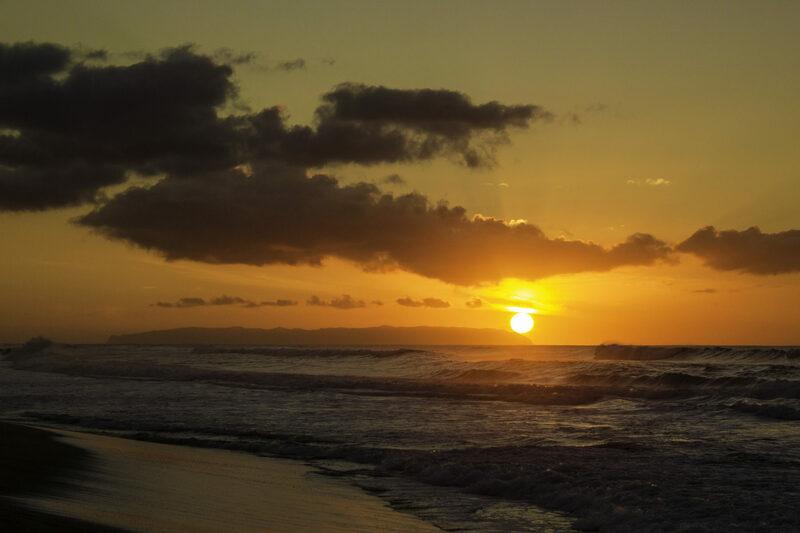 After the cruise, a staff member recommended we visit Polihale State Park. The beach, he said, was “deserted and magical.” We were sold. En route to the park, we pulled over at Omoide Bakery & Delicatessen, a ramshackle convenience store off HI-50. 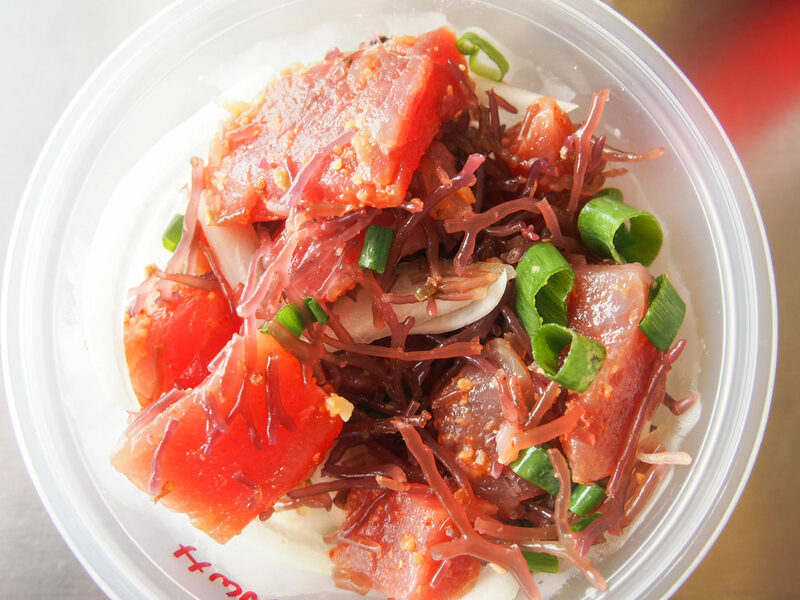 The deli had everything we needed for an afternoon at the beach: chilled Kona lagers, dangerously addictive Hawaiian Sweet Maui Onion potato chips and a deli case overflowing with variations of poke — the cold, sashimi-style fish salad served everywhere in Hawaii. The deli served fresh ahi tuna poke by the pound, and we stocked up on three different varieties. Our favorite featured a sweet and refreshing teriyaki marinade — perfect for a hot day on the beach. We also grabbed a couple bags of ice to keep everything cool. When we arrived, we saw clearly what all the fuss was about. 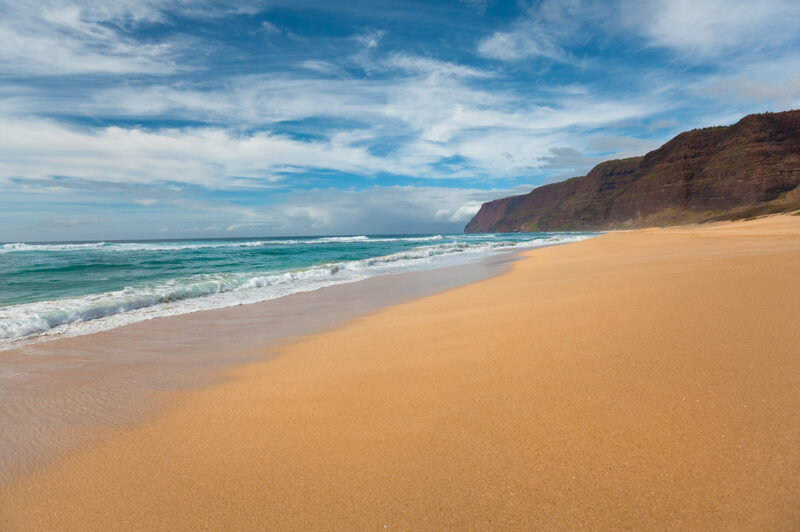 The beach abutted the edge of the Na Pali cliffs, creating a dramatic contrast of colors — the dark green cliffs left shadows on the white sand as the choppy aqua waves crashed ashore. We set up camp about 15 feet away from the water, which was at low tide. The currents were too rough for anything more than wading, so we enjoyed reading, tanning and munching our snacks. In the late afternoon, we walked on the edge of the water, strolling and splashing and admiring the sun as it dropped beneath the horizon. After sunset, I looked toward land and realized that our towels (and phones and car keys) had vanished. In fact, the beach was so pristine and deserted that the entire stretch of sand looked the same — and we had no idea how far we had walked. To top it off, the tide was coming in quickly. We ran laps in different directions for what felt like an hour before my friend finally found our towels. At this point, they were dangerously close to disappearing with the tide. Crisis averted, we gathered everything up and headed to our car. As we slowly drove out of the park, I felt grateful to have spent such a stellar day in paradise.